Thanks to their unique multi-functionality, active and intelligent packaging (A&IP) features are already in use for many consumer packaged goods. In particular, the food and beverage industry has been a recent focus for several applications that have attracted funds for research and development. These include several EU funded programs, as well as major research projects in the US and Asia. This flow of money is based on some very impressive forecasts of the market growth for food packaging containing these components. For example, it is estimated that up to 400 companies around the world are developing possible applications of nanotechnology in food and food packaging, according to researchers Suresh Neethirajan and Digvir S. Jayas in 2011. Observers say consumers no longer want preservatives in their food. The food and beverage industry needs to find other ways to extend shelf life and maintain condition. Nanotechnology, antimicrobial coating or laminates, additives or gas scavenging inserts as well as printed/deposited layers offer the advantage as they are mostly chemical free solutions. According to a 2014 Persistence Market Research report, the global nano-enabled packaging market for food and beverages is estimated to be growing at a compound annual growth rate of 12.7%, to reach about US$15 billion in 2020. According to their white paper The Impact of Nanotechnology on the Flexible Packaging Industry and Ink Applications for Sun Chemical, Tom Donvito and Rick Joyce stated flexible packaging containing nano particles in various formats can provide barriers for gas, odors, moisture and ultra violet light; improve structural performance; eliminate complexity in construction; reduces weight; and add functionality such as track and trace. In effect, they say nanotechnology will enable the next generation of flexible packaging innovation. Much current research is focused on the antimicrobial properties of nanocomposites. NanoPack is a three-year EU funded project aimed at developing and demonstrating a solution for extending food shelf life by using novel antimicrobial surfaces applied in active food packaging products. Several partners from across Europe and Israel, including Active & Intelligent Packaging Industry Association (AIPIA), are involved. The NanoPack technology consists in the encapsulation of essential oils with a naturally-occurring antimicrobial activity into Halloysite nanotubes (HNTs), which are subsequently mixed with polymers to make packaging films. As the antimicrobial agents are released as a vapor from the packaging materials into the headspace, they can sanitize both the product surface and the headspace. The antimicrobial film is made by mixing the loaded HNTs with a polymer. A first round of antimicrobial efficacy tests announced during trade show Anuga Foodtec 2018 showed the film’s ability to inhibit mold growth on food-additive free bread. The sample had no mold growing in the area exposed for up to 27 days, post packaging. Uniquely, the project also deals with the commercialization as well as regulatory and consumer acceptance of the film. Currently there are not many active packaging systems available, which could be related to difficulties in bringing the technology to the market as well as regulatory barriers. In another project, led by Purdue University, a team has created a new large scale manufacturing process using cellulose nano-crystals (CNCs) – derived from abundant resources such as wood and plants – as advanced barrier coatings for food packaging. The technique is scalable, as it is a roll-to-roll manufacturing process using waterborne polymer systems. CNCs are easily dispersed in water for manufacturers to control the structure and retain the properties that are needed for the barrier material. “The challenge for the food packaging industry is to create a recyclable and sustainable barrier material that is low-cost,” said Jeffrey Youngblood, a professor in the School of Materials Engineering. Scientists at Clarkson University near New York, US, have developed a low cost, portable, paper-based smart label that can detect spoilage and contamination of food and cosmetics, and provide easy-to-read results. Researchers have built a sensing platform that incorporates all the needed reagents for detection on a piece of paper. What makes the sensors unique are the nanostructures they use to catch and bind to compounds? They are printed electronics. 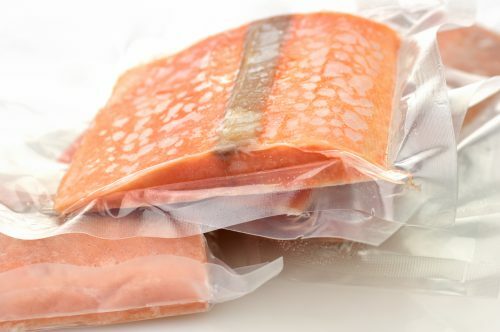 In Canada, the research institute FP Innovations has developed a printing approach to produce safe microwave susceptor packaging. Using a patterning approach to prevent overheating, the risk of scorching or ignition of the package is reduced, while increasing the heat uniformity of the food being microwaved. A susceptor is a material used for its ability to absorb electromagnetic energy and convert it to heat. In microwave cooking, susceptors are built into paper packaging of certain foods, where they absorb microwaves that penetrate the packaging. This process raises the susceptor patch temperature to levels where it may then heat food by conduction or by infrared radiation. By directly printing conductive carbon ink onto cellulose-based substrates, sustainable ‘active’ food packaging can be achieved while lowering production costs and streamlining the manufacturing process, according to FPI. This approach can be executed with existing printing presses and offers heating profiles by adjusting the printing conditions. The researchers say there are several competitive advantages to be gained from this new approach. Particularly, there is increased product safety over previous printed susceptor technologies, while, at the same time, susceptor manufacturing costs fall by 20% to 30%. In addition the print active areas and graphics on packaging can be applied in one operation, simplifying the supply chain and converting process. A major benefit is that the packs are compostable. FPI sees a number of possible applications, such as single component food packages (popcorn bags, pizza boxes, sandwich wraps); food containers with multiple zones for different types of goods such as meat, potatoes, pastry, vegetables; packs that can grill customized patterns on a food item; as well as other large-area heating and drying applications. A highly cost effective way to give plastics, whether flexible or rigid, antimicrobial properties, is to introduce additives into the masterbatch. This has the advantage of being low cost compared with other solutions, but also, in terms of re-use, the microbial defense properties do not diminish. Several companies are now supplying such additives, with one offering an additional feature which makes the plastics material change color as the product degrades and emits gases, which trigger the change effect. This is still under trail but should see a commercial launch in 2019. Another area of rapid development is in condition monitoring, both in the supply chain and in the retail environment. For improved supply chain management, several companies offer consignment, batch or item level monitors. These solutions range from a simple stick on label which changes color if a temperature excursion occurs, up to a highly sophisticated global positioning system, GPS, real time tracking device that can be monitored remotely and provide all kinds of shipping data. The disillusionment with Best Before, Sell By and Use By labels is becoming increasingly vocal and even reaching parliamentary levels. The industry is already facing a crisis over the clamor to reduce food waste. While much of this still occurs in the home, a significant proportion lies with the retailer. Much could be done to improve it. On pack labels which accurately show the condition of the (perishable) product inside are readily available at minimal cost. While several supermarkets are now using them on some meat, fish and dairy products, this seems a slow process. With researchers claiming that retailers who reduce their food waste from 2% to 1.5% would add 17% to their profits from these products, one must ask the question: Why would you not want to do that? And the beneficial impact on the environment would be enormous. While some beverages – such as juice and dairy – face similar issues to proteins, such as shelf life extension or contamination by heat or odors, there are many which use A&IP features for security or tamper evidence and, particularly, consumer engagement. Active and intelligent packaging can be highly disruptive technologies and offer brand owners some ways to differentiate their product in highly competitive markets. Radio frequency identification/near field communication tagging and quick response codes enable traceability, authentication and tamper evidence all-in one component, with the added benefits that a consumer can interact with the brand through their smart phones. These solutions can offer discounts and loyalty programs, as well as entertainment. In the latter case the use of augmented and virtual reality is becoming increasingly common. Challenges exist for any new technologies in food and beverage packaging applications, such as developing materials that work as well as they claim, meeting health and safety requirements, and gaining industry and consumer acceptance. Also relevant is the extra packaging cost, even though active packaging is expected to prevent food waste and save money. A major issue is possible migration, as quite a number of commercialized forms of antimicrobial food packaging are coated or composited product with inorganic materials, such as silver and nanoclays. Concerns exist, in some studies, about the possibility of nanomaterial migration from packaging to foodstuffs, particularly for silver. Regulatory bodies such as the European Food Safety Authority and the US Food and Drug Administration have taken a pragmatic stance on some of these developing materials. With so much research and commercial development in progress, only enabled by huge amounts of investment, the way ahead for A&IP seems secure. There is clearly a need for it, and it is a catalyst for innovative and novel materials, printing solutions and added value features which make the pack a powerful marketing tool. This is already moving the packaging sector forward. Cost and scalability remain as constraints, as they are being addressed. And while regulatory issues and consumer acceptance are other potential barriers, there is now a much wider acceptance of A&IP by packaging converters, brand owners and retailers.